Normally political things are avoided on Tickets There (aside from our irate Twitter account) but all of us here would like to congratulate Michael D. Higgins on winning last week’s election. 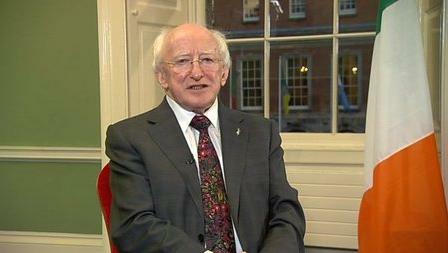 Mr. Higgins will be Ireland’s 9th President since the formation of the office in 1938. The first person to hold the position was Douglas Hyde, followed by Sean T. O’Kelly, Eamon De Valera, Erskine Childers, Cearbhall Ó Dálaigh, Patrick Hillery, Mary Robinson and Mary McAleese. The President elect will be formally inaugurated on November 11th. Michael conducted an extremely mature, admirable and dignified campaign. He spoke well, made light of the constant references to his age and height, debated miles ahead of the other candidates and won the support and love of Ireland in the past few weeks and months. He is loved and admired by his home constituency in Galway and has been involved in music / film and political movements that have changed the face of this country. Tickets There will always be open and admit Michael did not have our Number 1 for most of this campaign. Like many others, we learnt a sad truth just a couple of days before the election and Michael’s continued charisma picked up the pieces, securing our vote and support. Tickets There wishes Michael a fruitful term as President and we have no doubts that if anyone can inspire hope and confidence in the Irish people, it’s him. This entry was posted on October 30, 2011 at 1:16 pm and is filed under General Tickets There Blog with tags Michael D. Higgins, President of Ireland. You can follow any responses to this entry through the RSS 2.0 feed. You can leave a response, or trackback from your own site.